This past April, when all the high-performance Windows laptops transitioned to Intel’s new 8th-generation “Coffee Lake” processors, Apple fans were left scratching their heads. If it offers such a huge boost in performance...why isn’t Apple upgrading the MacBook Pro? Well better late than never, as they say. Apple’s bumping up the specs of the 13-inch and 15-inch MacBook Pro (with Touch Bar) to the 8th-generation Intel chips, plus adding a few other goodies that should help make them tear through your Final Cut and Photoshop tasks. We will test, benchmark, and thoroughly review the new MacBook Pros just as soon as possible, of course. While you wait, let’s dive into the specs, compare them with what we know from Windows laptops, and paint a picture of just how much better these new MacBook Pros may be. The chief benefit of the new 8th-generation Core processors from Intel is a boost in core count. In the 13-inch MacBook Pro, you’re jumping up from dual-core Core i5 and Core i7 CPUs to quad-core. Currently, the 13-inch MacBook Pro with Touch Bar offers a Core i5-7267U at the low end up to a Core i7-7567U at the high end. These are processors with a 28-watt TDP. We don’t yet have the exact model numbers of the CPUs in the new MacBook Pros yet, but judging by the announced clock speeds and the similar TDP necessary, we expect to find a Core i5-8259U at the low end and a Core i7 8559U on the high end. This change would mean higher boost clock speeds (3.8GHz versus 3.5GHz on the low-end model, 4.5GHz versus 4.0GHz on the high-end model). It also means 6MB of cache instead of 4MB. The Iris Plus 655 graphics processor is essentially the same as before, but with double the embedded DRAM, which should speed things up a bit at higher resolutions. For the 15-inch MacBook Pro with Touch Bar, we’re likely looking at a bump from the Core i7-7700HQ to the Core i7-8750H on the entry-level version, with the maxed-out configuration jumping from a Core i7-7920HQ up to Core i9 8950HK. Those processors all have a 45-watt TDP, but it’s a jump in maximum turbo speed from 3.8GHz to 4.1GHz on the base model and from 4.1GHz to 4.8GHz on the high end. Higher boost clock speeds are nice and all, but the biggest benefit is the higher core counts. The powerhouse 15-inch MacBook Pros jump from 4 cores with 8 threads up to 6 cores with 12 threads. Those who like the more compact 13-inch model get an even bigger increase, jumping from 2 cores and 4 threads to 4 cores and 8 threads. Our friends at PCWorld benchmarked the new Coffee Lake 6-core processors back in April and came away very impressed. 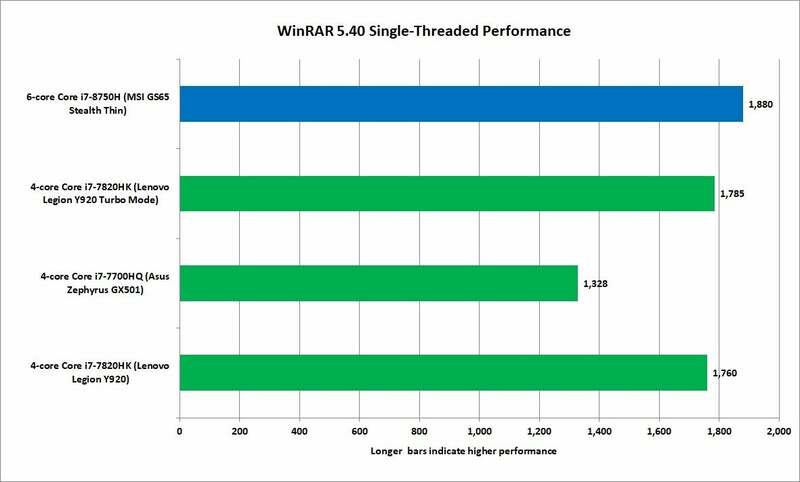 One would expect that more cores would equal more performance in heavily multi-threaded applications. Imagine their delight when the new processors delivered significantly better single thread performance as well. For example, here’s one of their WinRAR benchmarks showing the Core i7-8750H (the chip likely to be in the entry-level 15-inch MacBook Pro) blowing the doors off the Core i7-7820HK, a faster chip than the 7700HQ found in the current 15-inch MacBook Pro. 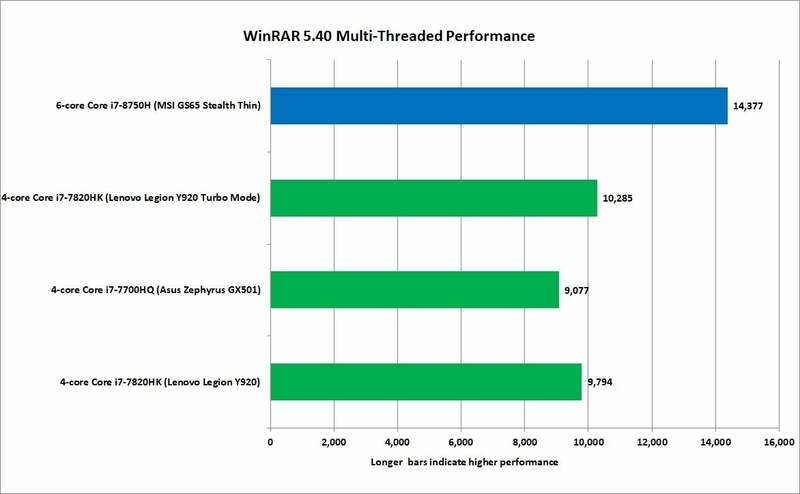 More cores mean much faster multithreaded performance. But dial the test down to a single thread and it gets real interesting. The 8750H is still faster than the 7820HK, and much faster than the 7700HQ. Even with one thread, Intel’s processors are faster. That’s the magic of higher boost clock speeds and increased cache. 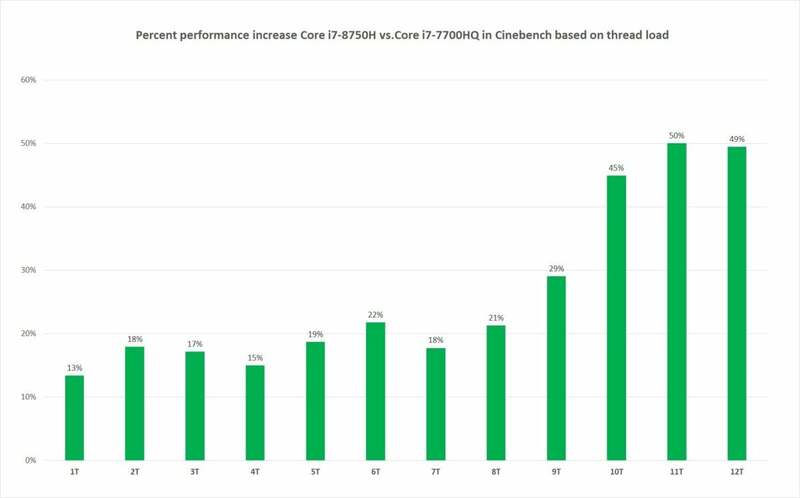 If we look at Cinebench performance scaling from one thread up to twelve, we see that even on low thread counts we can expect the new generation to deliver around a 15 to 20 percent boost, with high thread counts up at 50 percent. Bottom line: Expect the 15-inch MacBook Pros to be 15 to 50 percent faster in CPU-limited tasks. Even with low thread counts, the 8th-generation Core chips are much faster. And that’s just the jump from the 4-core to the 6-core chips. Imagine the boost we’ll see on 13-inch MacBook Pro with Touch Bar, where the cache and boost clock speeds go up and the core counts double. Combined with the fact that more apps are able to effectively utilize 5 to 8 threads than 9 to 12 threads, the 13-inch MacBook Pro is likely to realize its potential more often than the 15-inch model. Apple’s smaller MacBook Pro is going to realize a bigger performance increase, more often. The new MacBook Pros benefit from more than just the impressive gains of Intel’s 8th-generation Core processors. There are quality-of-life improvements like True Tone displays (which we love on the iPad Pro, iPhone 8, and iPhone X), a new third-generation butterfly keyboard that isn’t quite so noisy, and you can load ‘em up with double the RAM (up to 32GB). 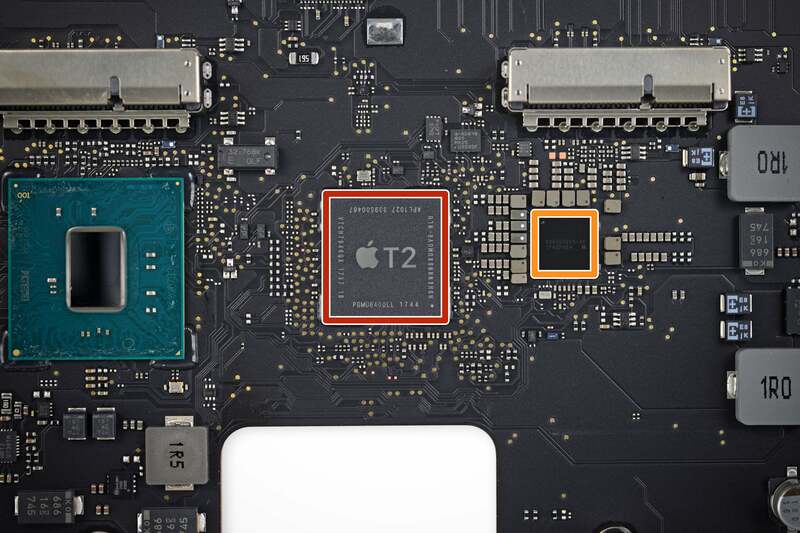 But Apple also snuck the T2 chip (first found in the iMac Pro) into the MacBook Pro. As Jason Snell correctly predicted, the T2 (and future T-series chips) are likely going to push down into all Macs over time. In the new MacBook Pros, the T2 chip does everything it does in the iMac Pro: It’s the audio processor, it handles image processing for the FaceTime camera, it controls storage (including offloading file encryption), it’s the secure enclave for Touch ID, and it provides secure boot and system management. Including the T2 in the new MacBook Pros makes it more than just a CPU upgrade. That means less work for the CPU, which should further boost performance just a little bit. It also means better FaceTime video quality and, finally, “Hey Siri” support on a Mac laptop. Unfortunately, the new MacBook Pros don’t offer everything we hoped for. Even if it’s quieter, we suspect many users will still take issue with the butterfly keyboard. The USB-C-or-die port situation hasn’t improved. And if you don’t like the Touch Bar, you’re stuck in the past—there are no upgrades at all in the 13-inch MacBook Pro without Touch Bar. Nor is the MacBook or MacBook Air getting an upgrade today, but we’ll hold out hope that we’ll see improvements for those before the end of the year. If there’s one area in which you shouldn’t expect a huge improvement in performance, it’s graphics. The Iris Pro 655 found in the 13-inch MacBook Pro isn’t much different from the Iris Pro 650 you find today. The embedded DRAM has doubled, and that will help a bit at high resolutions, but the GPU still has 48 execution units and 384 shading units, and the maximum clock speeds only get a tiny little boost. The 15-inch model—which always included discrete graphics—includes a Radeon Pro 555x with 4GB of RAM. It’s nice that every model has 4GB of video RAM now instead of the entry-level version being equipped with only 2GB, but we’re otherwise looking at the same GPU here. An upgrade to Vega-based graphics would have been great.